No meeting on Friday morning June 29 this week as Rotating the Wheels will be held at the Newport (Shores) Yacht Club, 81 Skagit Key, Bellevue WA 98006 on Saturday night, June 30. The appropriate dress is your Scottish finest! 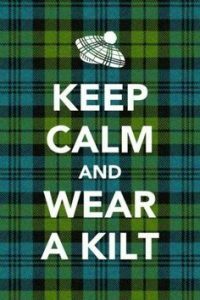 New Members - Sam Peterson and Kevin Polzin - Welcome! 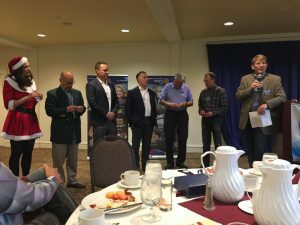 We inducted two new members into the club – Sam Peterson and Kevin Polzin. This will take our total new members for the Rotary year to 13 (a 15% growth rate and we will net out at 7 new members). Sam and Kevin were co-sponsored by Martin Clavijo and Steve Roberts respectively. President Kaj Pedersen inducted the two gentleman, noting that they are both interested in promoting engagement in our community through service, whether that is through civic responsibility or by setting an example to their children, it is clear their involvement is something that we will benefit from within the BBRC. It is also good to see that we have two new skiers joining the club! 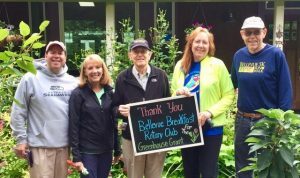 Great fellowship, great weather and a little backbreaking work made a small dent in the daily upkeep of Tavon Learning Center’s beautiful 6 acre campus on the Issaquah Plateau. Tavon Learning Center is a recent grant recipient that received funds for the upkeep of their greenhouse operation. 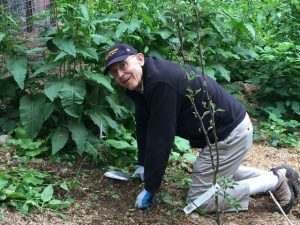 Tavon provides active learning and community programs that empower adults with intellectual and developmental disabilities to acquire home and community skills for living better. For people with disabilities, having an equal opportunity to participate in post-high school learning and make community connections can change everything! Tavon’s Garden Market Stand is back for Summer! Tavon provides fresh produce and herbs picked straight from their gardens, local honey, homemade baked treats, and blossoming flower arrangements, all in one stop. You can find Tavon at Gilman Village, outside of Mudhouse Pottery, every Thursday from 11:30 – 3:30 PM until mid-September. All proceeds go directly to our programs and benefit our members. How Much: Tickets are $50 – BUT WAIT!!! If you register TODAY you can get them at an EARLY BIRD rate of $35. The Early Bird Sale Price ends June 15th!! Questions?? Hit the blue button and email Carmela!! We had a great turnout at the Issaquah Food & Clothing Bank for this weekend’s work party. 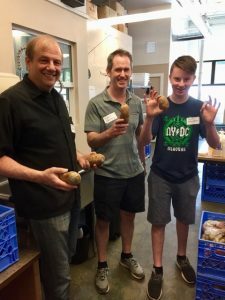 Several BBRC’ers did “spud scrub” (sorting potatoes) and office work. 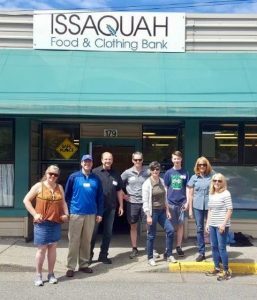 The Issaquah Food and Clothing Bank provides support to hundreds of families each week. Each month the IFCB secures, processes and delivers over 75,000/lbs. of food. During the holiday season (Thanksgiving – New Years) they handle close to 175,000/lbs. of food. IFCB also provides case management, holiday gift programs, school supplies, toiletries and more to local families in need of a helping hand. 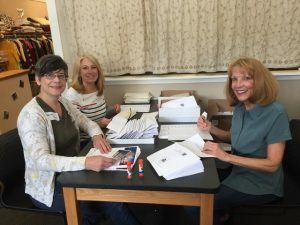 Each week IFCB assembles 280 “superpacks” – these include school lunches for grade school students.